Retail sales surged in the last days before Christmas but not as much as expected, two reports confirmed Wednesday, putting more pressure on stores to get shoppers to open their wallets in the final days of December. According to the International Council of Shopping Centers, same-store sales rose 2.0 percent for the week ended Saturday compared with the previous week. Same-store sales rose 1.7 percent compared with the year-ago period. Same-store sales are sales at stores open at least a year and are considered the industry standard for measuring a retailer's health. 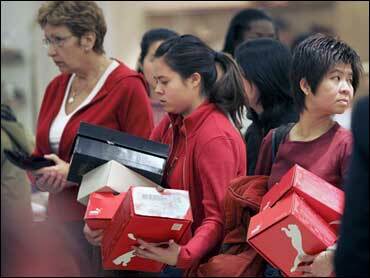 Still, it ain't over 'til it's over, and post-Christmas sales are drawing shoppers back to the mall this week. "I don't think there was much shopping done before Christmas. I think everyone was just waiting for the specials," said a shopper. Based on results so far, Michael P. Niemira, chief economist at the International Council of Shopping Centers, now believes that same-store sales growth will be at the low end of his already-reduced range of 2.5 percent to 3.0 percent for the November-December period. He noted that the 2006 holiday season has been hard to read, with a number of factors affecting sales. They range from mild weather that dampened sales of winter items like heavy coats and gloves to a quirk in the calendar — a full weekend before Christmas Day, he said. But Niemira said he is counting on the throngs of shoppers who are returning to stores this week to redeem their gift cards to help salvage the season. Gift cards are only recorded as sales on a retailers' balance sheet when they are redeemed. According to a recent study by Accenture of almost 550 consumers, almost half of the respondents spend more than the value of the gift cards when they redeem them. The study also found that most respondents spend their gift cards in a single trip within three months of receiving them. The trend, however, is toward taking longer to spend the gift cards. Retailers even see opportunity in the long lines of people returning Christmas gifts. "They realize that as long as people are coming to the store, that's an opportunity to make a sale," said Scott Krugman of the National Retail Federation. ShopperTrak RCT Corp., which tracks total sales at more than 45,000 retail outlets, reported that sales for the week ended Saturday increased 5.2 percent over the year-ago period. Foot traffic fell a slight 1.3 percent during that same period, indicating that shoppers were making bigger purchases with fewer trips, according to Bill Martin, co-founder of ShopperTrak. Visa credit card use might be a good benchmark, reports CBS News correspondent Bill Whitaker. Spending by the credit card's millions of customers rose 6.5 percent this Christmas. Not bad, but last year was much better, up 8.3 percent. Much of last week's strength was from Friday and Saturday, though the finale wasn't as strong as hoped for. As a result, Martin believes that total holiday sales will probably not meet the 5 percent growth forecast, though holiday sales growth will be at least 4.5 percent. The National Retail Federation, the industry trade association, is sticking to its holiday growth forecast of 5 percent. The figure excludes business from auto dealers, gas stations and restaurants. "This is crunch time. They're going to pull out all the stops to make sure they're going to have a successful season," said Krugman.